Coco made her do it: You choose books, I choose boots. When you have your first pair of over the knee boots, you will understand. You will realise that no other shoe in the world matters, all will become a distant memory and your wardrobe will solely revolve around these beautiful creations. November arrived and it was a beautiful afternoon in Scotland. November in Scotland will almost always be cold, wet, snowy and miserable. It was just such a buzz for it to be crisp and sunny. They are almost the perfect kind of days to shoot outfits. As you can see the leaves have fallen and they are the perfect autumn colours. I wanted my outfit to show a more relaxed version of the boots. The type on outfit you can put on and go for some lunch, going visiting or just general day to day errands. I tend to wear my black skinny jeans with everything, you know how everyone has a safe piece of clothing?, these are mine. This outfit would be perfect with an oversized coat or even just a leather jacket, depends how cosy you want to be. As it was just a crisp afternoon, I was happy to just pair this with one of my favourite scarfs ever. I got this as a gift last christmas and I have a feeling it will be around for many christmas's to come. You really cannot fault Zara at all, their clothing speaks for itself. This scarf and jumper are both from Zara- approx 25 quid each which is great for essentials. 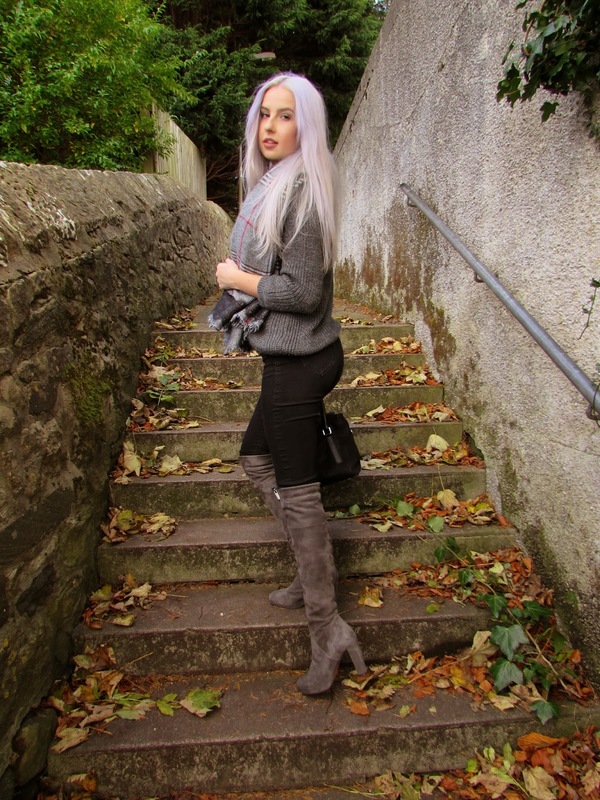 My trusted Karen Millen bag and Primark skinnies.. Throwing together an outfit like this is totally effortless. If you can keep some staple items in your wardrobe, it becomes really easy to put something together, especially since you know it all goes. For me this is more of a relaxed outfit if, especially if I wanted to stay away from the trainers/ghetto look, would you wear this out for lunch?